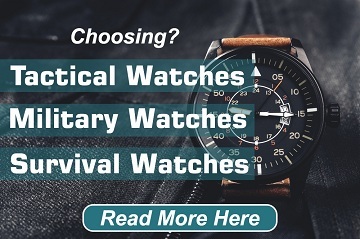 If you’re thinking about rushing out to that big sporting goods/outdoor store to spend a month’s worth of income on the latest and greatest camping gear, you may want to stop for just a moment. Give this idea a bit more thought. Even if you have a whole lot of extra money to spend, you can get what you need without digging too deep into the bank account. It’s tempting to begin acquiring gear as soon as the weather begins to improve. But you’d be wise to take an extra day or two to learn a bit more about the products you can buy, which is different from the camping gear you really need. Start by thinking about the type of camping trip you’re going to be on. If you’re used a base camp and taking short hikes each day, you’ll need to equip that home base. 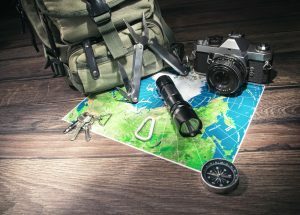 If you’re going to be staying through the night in one place, then hiking to another location for the next night, you’ll have to prepare to carry what you need. The second of these outdoor activities is known as backpacking. The other is what most people consider to be camping. With this difference in mind, you should start thinking about the weight you can carry and how easily you can pack the essentials. This will help you narrow the choices down as you shop for essential camping gear for beginners. Start with the obvious. 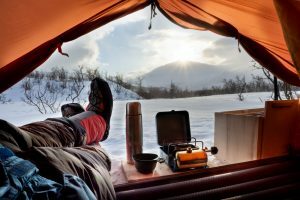 You’ll need to put some sort of “roof” over your head, which means you should have a good tent, with the necessary poles, stakes and cord or rope to tie it down. You’ll have a decision to make at this point, because you need to decide on the type of tent and the overall size. Ask this question: How any people will be sleeping in that tent? This will put you in a category, eliminating small tents, medium-sized tents or very large tents, depending on the size of your camping/backpacking group. You may want to carry a large tent so you’ll have plenty of extra room inside, but you should consider the weight and your ability to pack it for transportation. If your journey is going to be one of the base-camp variety, you can use a larger tent because you won’t be carrying it from one location to another. Generally, a larger tent is good when you’re driving to a camping location and staying there. Plan on spending $200 if you want a really good tent. But if you’re a true beginner and don’t know if you’re going to be using this essential piece of equipment in the future, you may be able to get buy spending less. Quality tents, depending on how many people they will house, usually run from $100 to $300. Plan on having a waterproof tarp or similar ground cloth, one that will protect the tent bottom from moisture in the ground. The next items you’ll need to consider are the sleeping bags and pads you’ll use to stay comfortable during the night. There are dozens of different bags meant for specific weather conditions and types of camping. You can get a great, general-use sleeping bag for less than $200 and you should be comfortable even on the coolest nights. But take some extra time to think about what type of weather and temperatures you’ll be experiencing. You can get an affordable, lightweight bag that works best in warmer weather, or one that will protect you even in extreme conditions. The first can be inexpensive, around $50, but you won’t be able to depend on it for comfort in cold weather. At the other extreme as far as price goes, the Tennier with military rating (good down to -30 degrees) will set you back about $250. For beginners who will be camping in warm weather, you should be about to hit the $100 mark and be comfortable. Make sure you have a good sleeping pad under your bag. Try a lightweight air mattress or one of the roll-up mats often used by the military for an inexpensive solution. If you and your group will be carrying your camping gear from one sleeping location to another, it’s important to give plenty of planning time to the backpack you’ll carry. You can get a suitable pack for $100 to $150 when you’re just starting out. Don’t try to buy your backpack where you get school supplies for your children. You’ll definitely benefit from spending a bit more for a backpack with solid, cushioned straps and a few extra pockets to keep small items secured. You can spend somewhere in the middle of the range and you’ll be fine, unless you plan to head out for a week and not come back to a camping site. The Osprey Escapist is available for about $80 to $100, to give you some idea of a good, average backpack cost. Cutting weight from what you’ll carry may be the most important factor to think about, so don’t buy a huge backpack and then just fill it up. The Deuter Climber at $70 is also a good, beginner backpack. Other items you’ll definitely need to account for are lights, lanterns and flashlights. These are like those credit cards – Don’t leave home without them. Get a good camping lantern if you’re going to be in one place most of the time. LED is good because of the maximum illumination for flashlights. Be sure to plan for plenty of batteries and, if you’re using one of the old-style lanterns in the campsite, bring plenty of fuel. You can get a great LED camping lantern for $20 to $50. When you’re heading out for even one night in the open country, make sure you take along plenty of fresh water. This is going to be a lot easier when you set up a base camp and only head out for the day on shorter hikes. You can pack a couple of large containers in the car and you usually won’t run out of water. If you are backpacking, you’ll need to plan for water-treatment tablets and/or filtering systems. Some of the newest products do a remarkable job with most water supplies. You can also use tablets to treat water you get from various sources. The best bet is a quality water-filtration system when you’re on the trail and don’t have a base camp. 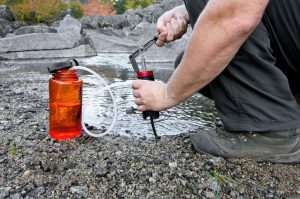 The Lifestraw company makes some very popular and effective filtration systems, or you can use the Sawyer system which can be purchased for about $20. The other essential item is a good pair of hiking boots or shoes. In fact, if you’re going to be away from home for a few days, you should definitely take two durable but comfortable pairs. Don’t depend on a pair of sneakers, unless you’re going to be walking on paved trails or smooth ground. You’d be wise to invest in a good pair of hiking boots from one of the top manufacturers, such as Timberland, Keen, North Face, Merrell or Vasque. 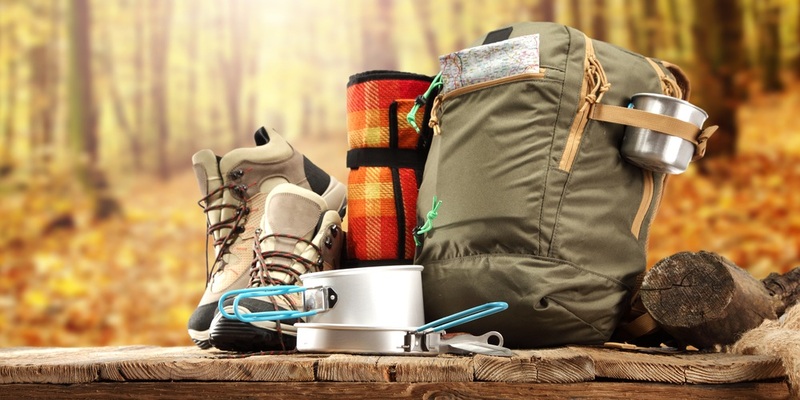 Two more items you should plan on having with you on any camping excursion – first-aid kit and cooking equipment. Even if you have aspirin, ibuprofen, bandages and gauze you’ll be better prepared than some who don’t prepare a first-aid kit. Bring along some bug spray and aloe vera for burns as well. You can purchase a ready-to-use kit at a reasonable price so you’ll have all you need and more. Plan to spend $30 to $40 for a good first-aid kit. You’ll be glad you did. You should also make provisions for eating and cooking, though this is usually the area in which people pack way too much stuff. You can usually find a small, easy-to-carry stove and fuel that won’t be heavy or take up too much room. Coleman still makes a reliable camp stove, which won’t set you back more than $40 or $50. If you want something with a bit more punch, you can spend $180 for the Powerhouse model. Again you’ll need to consider what you can carry. Take only the pots, pans and other utensils you absolutely need, including a few cups and bowls. Several companies make complete dining kits of heavy-duty plastic, so you’ll only need to carry metal pans etc. if you plan on cooking a hot meal once or twice each day. Be sure to take along some clean-up supplies, a few small, absorbent towels etc. You’ll be glad you did. If you’re in the planning stages of a camping trip, and you’re going to be staying in a base camp for several days, you should still pack carefully. It’s always a good idea to actually write a list and check items off that list as you put them in your vehicle. This is a good process if you’re leaving the base camp for a day hike too. It’s disturbing to be several miles from camp, on foot, only to discover you didn’t bring the water filter or anything to eat other than a peanut-butter sandwich. My friends and I are going out for a week long camping trip! But this is the first time I’m going out without my parents, and would like to make sure that I am prepared. I like the point you made that I should be able to get a great general-use sleeping bag for less than $200, but I will still be comfortable on cold nights and during crazy weather conditions. This article really gave some great tips about what to consider when I finally go shopping for gear!